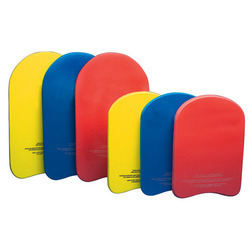 Pioneers in the industry, we offer kickboard and swimming antiwaves lanes from India. With the help of well-trained professionals, we are engaged in offering Small Kickboard to our clients. The offered boards are made available in various sizes to cater to the varied customer needs. Extensively used in various games, these products are highly admired in the market. Apart from this, customers can avail these products at market leading prices. We are eminent names in the industry in offering a wide range of Swimming Lanes to our patrons. These are designed to rotate dependently with others which allowing the wave energy to be absorbed and dispersed along the channel within the lane. Apart from this, for high strength and excellent corrosion resistance, these lanes are highly demanded by the customers.